Large Tuff Lock Quick Release Adjustable Collar -- 1 in. Wide. $12.99. "My dog gets many compliments, and other owners are always asking where we got the cool brass ID plate." Very sturdy and looks great. My dog gets many compliments, and other owners are always asking where we got the cool brass ID plate. "It's very well made and have not had any problems at all. Our first collar is still useable, but wanted a spare. Highly recommend for hunters or family pets." 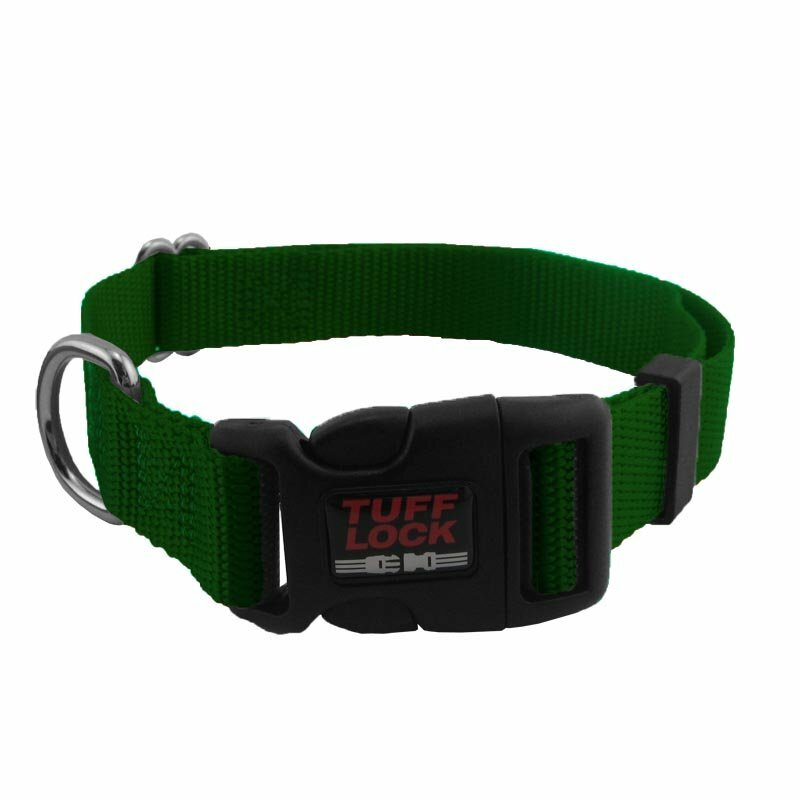 This is my second Tuff Lock collar, and an excellent well made product for our 90 lb English Labrador. It's very well made and have not had any problems at all. Our first collar is still useable, but wanted a spare. Highly recommend for hunters or family pets. "Great service and quick shipping." Great service and quick shipping. Received the collar with the engraved nameplate 4 days after ordering! "So pleased with this collar." So pleased with this collar. It looks great on our 70lb lab, and the engraved plate is perfect. It also came within 2 days of ordering! Thank you for the quick service. "This collar is built sturdy and looks good." This collar is built sturdy and looks good. The lock isn't built cheap like other brands that my dog has pulled apart. Plus the brass name plate looks good, and gives me a good sense of security that if he was lost someone could find me. Another thing I like about this collar is the heavy duty D ring, again with other collars my dog has simply pulled until they came apart. My dog has not had this collar very long yet, but this seems to be the best built collar he has had. "Worn in the thickets right out of the box and has held up nicely." Worn in the thickets right out of the box and has held up nicely. Holds the brass plate well too. "This is a good collar." This is a good collar. I purchased two, but I put in the wrong size for one so I'm returning it. The company was very helpful in that process. I'm happy with the company and with the products they offer. Excellent design and durability. Gun Dog Supply's ID/name plates put it over the top for convenience. "I love it the dog loves it...could not be better...."
"Very durable and works well on my 3 year old lab." Very durable and works well on my 3 year old lab. I like the nameplate that it comes with as well. Makes the collar look expensive when it is not. Very good value for the price. "Good collar at a good price, especially with the tag included." Good collar at a good price, especially with the tag included. "Would definitely buy from this place again." Very professionally made, quickly done and looks great on our dog. Would definitely buy from this place again. "I like quick lock collars!" I like quick lock collars! This one is very good. Wished they made an E-Collar version that the bayonet half could be added after the receiver was fitted or ??? I love these collars! They last forever, and they are the only brand that I trust with a quick release. The color was as described, and the brass nameplate prevents that unwanted jingling song and is one less thing for my lab to get caught on in the woods or swimming. "Very pleased with the collar and brass name plate." Very pleased with the collar and brass name plate. Exactly what I wanted. The shipping was incredibly fast. I will proudly recommend this product. "Great collar from a great place." Great collar from a great place. I buy all my gun dog stuff from Gun Dog Supply. Nice collar. Bought a second one. Our dog has two collars. This collar was strictly bought for field use. So far so good. Easy on and off, free name tag, and seems to be very durable and bright, which I like. With the engraved name plate, they are excellent awards for competitors. Our club members love them. Buck B. "Nice light. Fits my Lab great." Nice light. Fits my Lab great. "The lock is a lot more robust than previous collars." The lock is a lot more robust than previous collars. The best part of the buying experience was dealing with GDS. This 1 inch collar was just a bit too big for my 11 month old Vizsla. The return was accepted no questions asked. Great Co.
"Love the collar for my dog." Love the collar for my dog. "I am very pleased with the collar!" I am very pleased with the collar! So is my energetic puppy! It fits just perfectly at 7 months old, with plenty of room to grow with her! The price was wonderful! Thank you! Quick release lock is perfect for active Goldens. Have found the buckle collars can get caught on fencing or bushes and come off, but these stay on. Name plate also doesn't leave metal residue on dog's fur. Great product and service. "Love the color and name tag great service." Thanks Steve. Love the color and name tag great service. This is a great product and has held up great. Definitely will buy again. Great Collar from a Great Company. This collar is very sturdy and it fits like they said it would! These are great! I I keep last year's on when traveling or lounging around house. Off when training or working.. The only reason I am replacing is that the name tag brad pulled through. Otherwise, the collar is fine. Well made. Steve is always quick to ship. Best nylon collar deal on the planet. I love the service, product and staff at Gun Dog Supply. Very helpful always. Super fast delivery! LOVE them!! Great collar. Bought the orange/pink collar. Love the color. We needed a collar that stood out, which this does and looks good on her. Great quality collar! I really like the name plate. It stands out. I have had positive compliments from people about the collar. I will buy another one if he needs another collar. "Very good collar and even comes with a mounted name plate." Very good collar and even comes with a mounted name plate. I have been using these for sometime now. Great collar. Awesome collar. Rocky can't remove his tag now since it is integrated into the collar with pop rivets. Will buy again if it ever wears out, which I doubt it ever will. Collar is good, but wish I could make it smaller. I have adjusted it to smallest setting but it is still a bit loose. "Good collar at a great price, especially with the included tag." Good collar at a great price, especially with the included tag. "I have had dogs all my life and this is the best collar I have ever had for my dog." I have had dogs all my life and this is the best collar I have ever had for my dog. No more tags making noise in the middle of the night when he shakes. Fantastic latch system. "Great product, super fast processing and shipping." Great product, super fast processing and shipping. Will continue to do business with Gun Dog Supply and will recommend to all my duck hunting buddies. "I do not leave collars on my dogs in the house, these are quick and easy to use." I do not leave collars on my dogs in the house, these are quick and easy to use. Britany Spaniel. Hunts. Family pet. This collar is great. It fits perfectly, is sturdy and virtually indestructible. With the riveted name tag we added, Rex loves that his tags no longer jingle, fall off or get tangled when he runs in the woods. "Product is as good as advertised." Product is as good as advertised. "Quality product with a nice brass ID tag." Quality product with a nice brass ID tag. Very prompt delivery. "We buy all our dogs this same collar in different colors and love them!!" We buy all our dogs this same collar in different colors and love them!! Very durable and lasts several years. The personalized name plate is a wonderful bonus. Thanks GDS! Your continued superior products and service are greatly appreciated! I LOVE this collar. I used to always purchase the buckle type collars but it was difficult to determine the right size. I am so glad I switched! 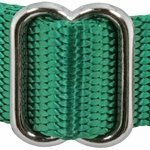 I have found the quality of collars at Gun Dog Supply to be excellent and they have such a variety to choose from. I have now purchased three collars from GDS and will continue to be a loyal customer! These collars are great! Love having our names and address listed also. "These collars are very well made." These collars are very well made. 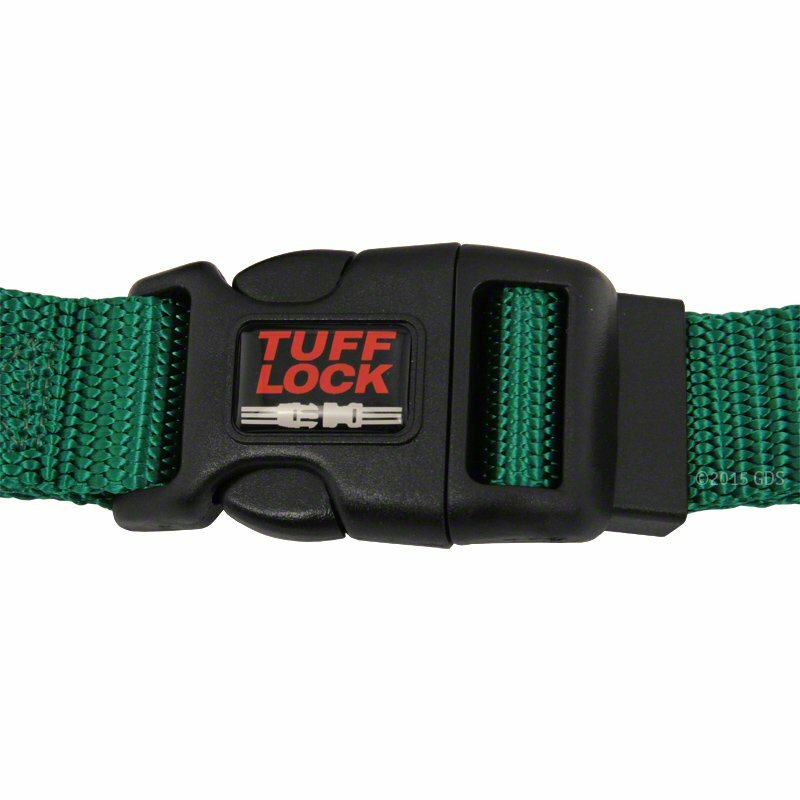 The Tuff Lock quick release buckle is one of the best that I have seen. The length of the large collar is very long; it will fit the largest of breeds. "Quick service and sturdy product." Quick service and sturdy product. "This is a great collar!" This is a great collar! I love the color but I really love how well it's made. It doesn't come unhooked, it's easy to adjust (plus it stays where you adjust it to). The attached name tag was a fantastic bonus! The price was more than reasonable. I will buy more in different colors. The collar is great. I can see and read the name tag. Outstanding customer service and very speedy delivery. Great product. Easy on/off. I put it on him every AM for a little play time before I put him in his kennel, and I go to work. After work and some exercise on the farmyard, I take it off when he comes in the house for the night. Great collar! Fits dog comfortably and securely! "GDS is our go to for Gus." We feel better because of having the brass plate with our info on it. Easy and free. GDS is our go to for Gus. Nice collar. Like that it includes pertinent info if she ever gets lost. Delivery was amazingly fast. Very satisfied. "Hyper lab who needs to have this release for my sake." Hyper lab who needs to have this release for my sake. Very satisfied customers! Collar is beautiful, durable, and just what we needed!! And the nameplate sets it off! Thanks GDS! "Great look. Fit and sizing perfect." Great look. Fit and sizing perfect. Gun Dog Supply is the best company I have ever worked with as for customer service. "Great quick release collar, and the free riveted tag is the final sell for me." Great quick release collar, and the free riveted tag is the final sell for me. "Great product and very fast shipping." "I'm very pleased with these collars and would purchase again." I'm very pleased with these collars and would purchase again. "The plastic quick release clasp is a great feature to compliment the training/containment collar"
"We recommended them to our local vet, who was also impressed with the quality and pricing." 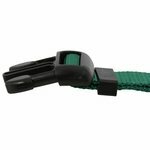 We just purchased (Two) new collars from Gun Dog Supply for our dogs use at the beach. Our other ones are three prior Leather purchases. The reasons we keep coming back: they make the best product, at the best price, with complete ease of purchasing, and will return any telephone call made to them and assist with your purchase. We have even recommended them to our local vet, who was also impressed with the quality and pricing. "Best collar I've found, and it's a great price also." Best collar I've found, and it's a great price also. "Great collar, good price, fast delivery." Great collar, good price, fast delivery. "Great quality, nice name tag feature." Great quality, nice name tag feature. Doesn't quite fit snug on my dogs 17" neck, 18" plus should be perfect, but it's tight enough for around the house. "Great Collar, and as always quick service!" Great Collar, and as always quick service! Great looking tough collar. It holds up well in the field and on the leash. "High quality. Easy to adjust." It is high quality, and I love the brass name tag. Easy to adjust. I do wish there was a better variety of colors (pinks, purples, tan and brown). "There is not a better nylon collar made." 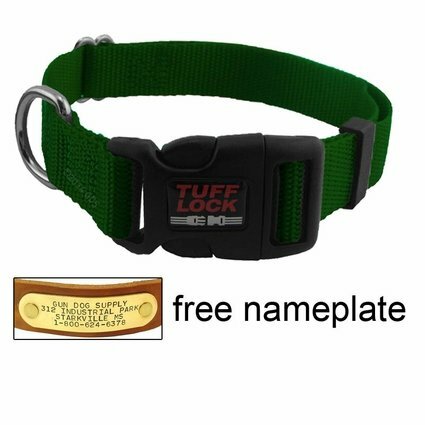 I have been using Tuff Lock collars for years. There is not a better nylon collar made. "They fit well and last a long time." We purchase 3 each year, so they each have orange collars. The only fault I find is the brightness of the orange fades after a few months. I'm sure there's nothing to be done about it except to buy the plastic ones. I don't feel they are good for the dogs hair and skin. They fit well and last a long time. I only buy new ones, so the orange color is bright. 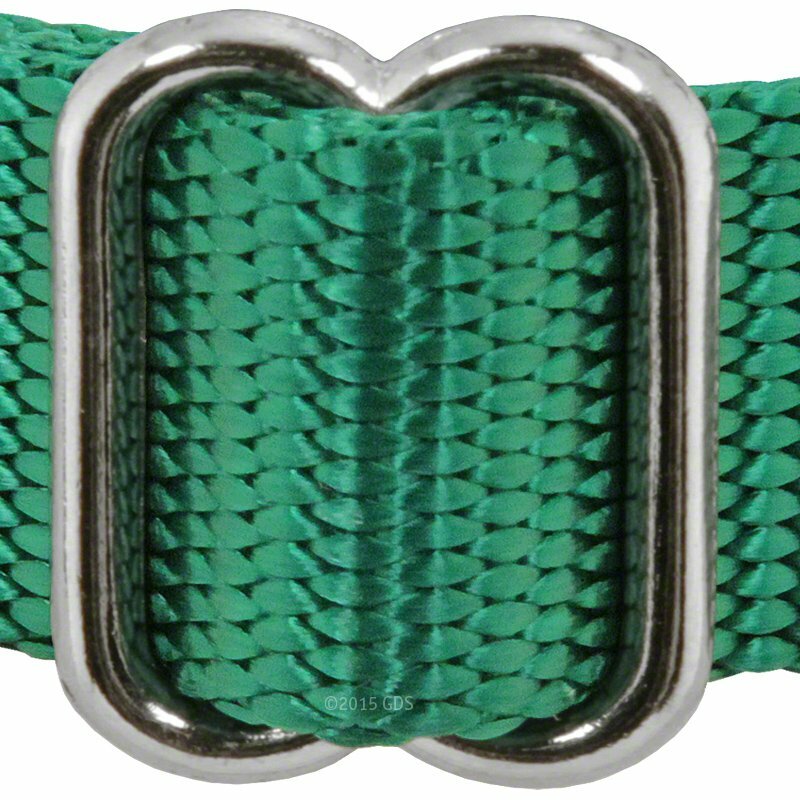 "It is quick on and off with a strong buckle." 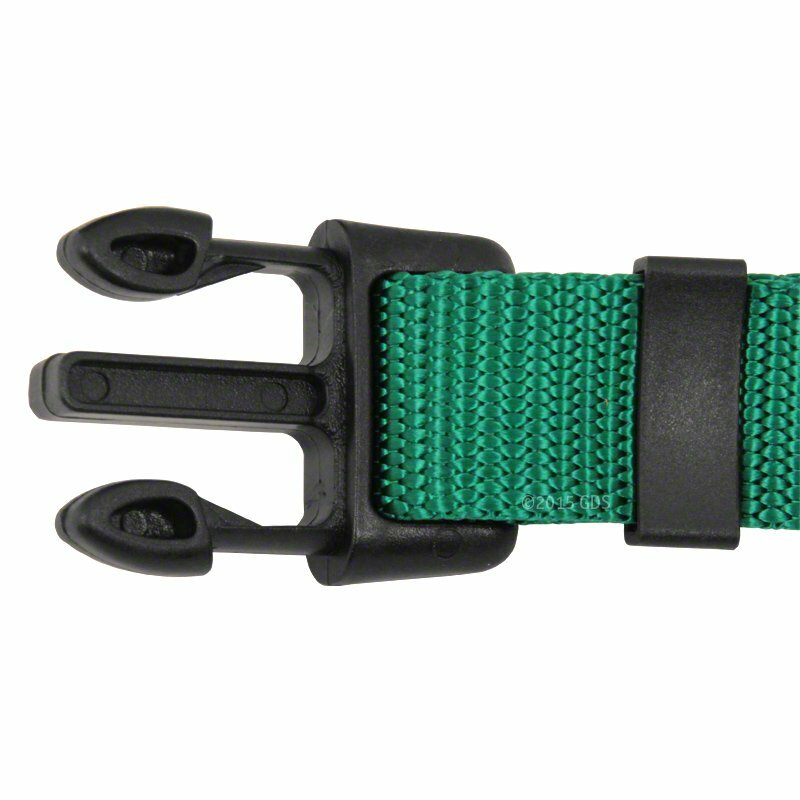 We use this as a training color with a 20' nylon lead; very little stretch. 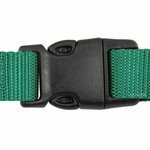 It is quick on and off with a strong buckle. We like the ID tag .... just in case. "These are great collars, and they last." These are great collars, and they last. "The collar withstands abuse others have failed in." Great collar. Fast shipping. My dog spends a lot of time in the water and tracking through brush, mud and thickets. The collar withstands abuse others have failed in. "Very strong and well built"
"Withstands salt water and salt air well"
This is a great collar I have bought before. The great thing about Gun Dog Supply is you get the engraved nameplate mounted on the collar. Very nice! Very nice collars. This is the 3rd time we have ordered collars. Never have been disappointed. Great value for the money. "We appriciate the speed of delivery and the quality of the product." Our dogs collar is great the low profile keeps her from gingling and making a lot of noise while still keeping her tagged. We appriciate the speed of delivery and the quality of the product. We have another dog with this same collar and she has had it for over a year and it still looks brand new. Perfect!!! It was just what I wanted!! "Great collar at a great price!" Great collar at a great price! Gun Dog Supply is stellar to work with - quick to ship, responsive, and want to be sure you're happy! "Great quality collar for the price." Great quality collar for the price. The construction of the lock is better than any I've used before, and the overall build of the collar is extremely durable. The free brass riveted info tags are of an excellent quality as well. Highly recommend this collar and company. Very strong good quality. Best "buckle" I have seen on a colar. "the way the tag is secured to the collar eliminates all the noise usually associated with dog tags." I bought the bright orange which complements her black fur. I fitted it with the strobe light for early morning walks. The brass nameplate is a god send since we live on the coast and all other dog tags rusted or disintegrated in no time. Also, the way the tag is secured to the collar eliminates all the noise usually associated with dog tags. "No more Rattle Rattle at night when he shakes and walking around on guard." No more Rattle Rattle at night when he shakes and walking around on guard. Perfect fit, and the tag on the collar will now enable him to come home when he jets out the gate. Thanks for the quick shipping and personal touch love it! "Great color and easy off and on"
Great color and easy off and on with the quick clip. Great product. High end materials. Great fit too. "Best collars we have found for a great price." 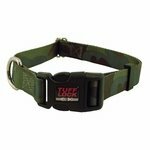 Best collars we have found for a great price. "This is a replacement for a 6 year old Tuff Lock Collar." 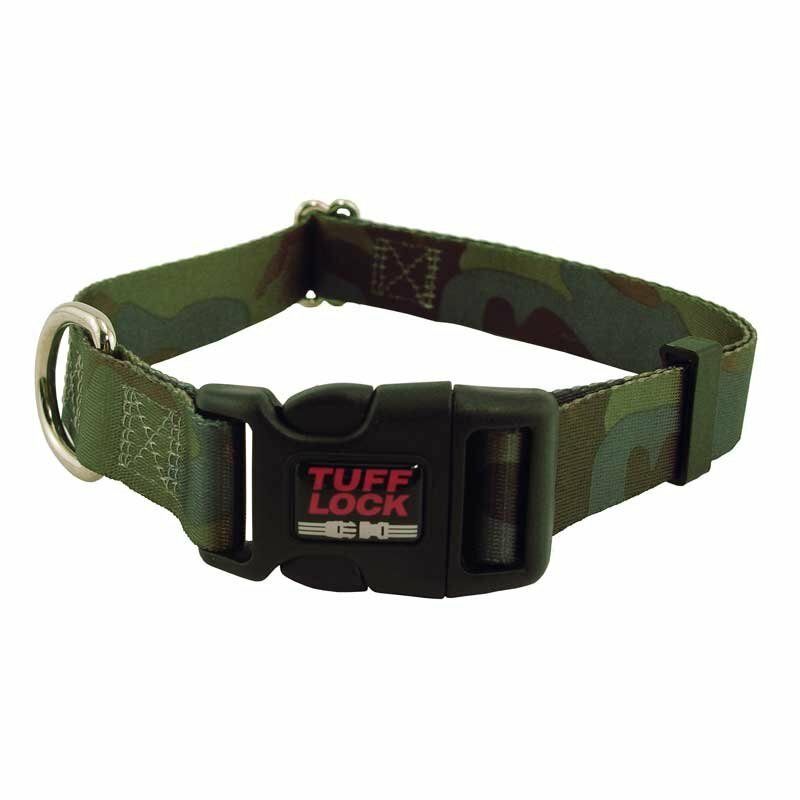 This is a replacement for a 6 year old Tuff Lock Collar. The new blaze orange color has a red tint to my eye. I hope the color holds up in the Florida sun as well as the old one did. Works great. Wish it would sinch up just about 1 inch tighter. Please let me know if you have a comparable collar that fits a wee bit smaller. "Another great collar Steve. Love the durable buckle." Another great collar Steve. Love the durable buckle. Great collar. Dog and owners love it. "I really like the name tag riveted to the collar." 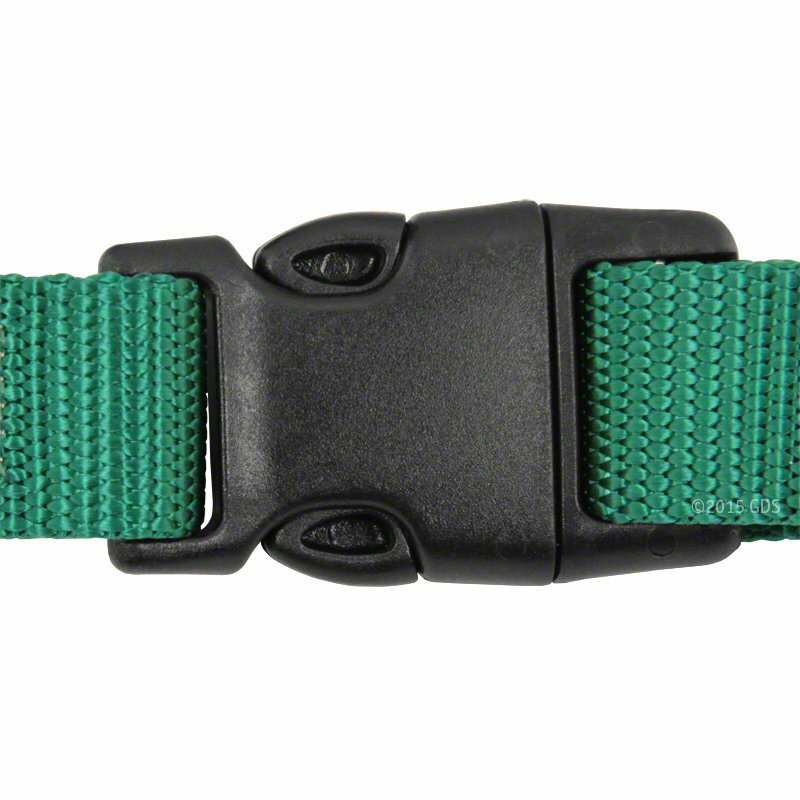 The buckle is robust and provides easy on and off. The adjustment is easy on the collar for size too. I really like the name tag riveted to the collar. My dog comes from working cattle dogs and is rough on tags. So far so good. "Excellent price, service, and product." Excellent price, service, and product. Thanks very much. Won't be my last purchase from Gun Dog Supply. "It seems sturdy and works well." It seems sturdy and works well. I got the it in orange for a hunting dog, but it looks almost pink next to other things orange. "I have been pleased with how the collar holds up, but was disappointed that the engraved name plate came off." Our dog loves to run on our farm and is always snagging her collar on a barbed wire fence. I have been pleased with how the collar holds up, but was disappointed that the engraved name plate came off. The color is nice, and it's large enough to for his neck, which was my main concern. This is our 3rd collar ordered from Gun Dog Supply. I love the collar, BUT due to the placement of the name tag on the collar, the clasp will not slide over the metal tag, so it will not adjust all the way down, and is too big for his neck. Fits 18 neck size,and the red color is excellent. 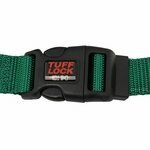 14956| customer-product-review-14956|tuff-lock-quick-release-adjustable-collar-med-3-4-in|tuff-lock-quick-release-adjustable-collar-med-3-4-in-ratings-and-reviews|Cliff Oliver From TX|Tuff Lock Quick Release Adjustable Collar - Med 3/4 In.|4|2014-10-28||2||Y|||eadd|Had to go to 3/4 to fit smaller neck size. "Collar is nice and looks good." Good collar, but black plastic bands are rough and scratch my hand when rubbing my dogs neck. Collar is nice and looks good. ID band seems really large. "Love the old school camo color." Easy quick release collar is great for walks and is super stylish. Love the old school camo color. I love the 1 inch collar more than the 3/4 inch. The quick clip on the 1 inch is easier to open than the 3/4 inch. The label is very secure on the collar. My only problem is I have 4 dogs, and 3 of them have a neck size between 16-17 inch, so with the label 3 of my dogs cannot wear the 1 inch collar, just a bit large. If the label was just a bit smaller or moved over a bit, then perhaps the collar would fit my smaller neck dogs. "Good collar for growing dog." Good collar for growing dog. Collars are okay. The buckles are a bit bulky. I prefer the old style where the buckles were more compact. "The collar itself is made a little thinner than I prefer." The collar itself is made a little thinner than I prefer. Great collar, but the name plates are starting to pull out on 2 of them already. My dogs only wear these collars in the house. ID Plate will reduce adjustability. With ID Plate, the collar fits roughly 17" to 25" necks. 1" wide adjusts to 16" - 25" neck sizes. 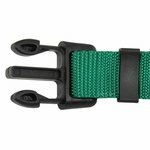 Single-ply, adjustable heat sealed premium nylon webbing with black plastic dual-action spring snap buckle. Available in red, royal blue, green, bright pink-orange, camo or black. Made in the USA. With ID Plate, the collar fits roughly 17" to 25" necks.